Front-matter and index of the book. The rest of the content, the Chronology itself, is at bahai-library.com/chronology where it has been greatly expanded and modified since original publication. This book can be purchased online at grbooks.com. Posted here with permission. The published version includes extensive notes and photographs, which are lacking in this online version. However, this online Chronology is larger and contains different content and metadata. As well, it contains Cameron's updates to his published manuscript: events since 1996. See also a scan of the published version. Great thanks to G. Cameron for sharing his dataset, GR for permission to post it, and B. Lyons for proofreading/formatting. A debt of gratitude is owed to Arjen Bolhuis for his continuing work as editor and manager of the Tags. Thank you Arjen. acknowledge the source in any published work. Use the "Contact" button below. A Basic Bahá’í Chronology is a reference book intended to serve the needs of readers, authors, students and researchers. Much effort has gone into making it as accurate as possible. However, there are difficulties in dating some events, particularly in the early period, to which the reader’s attention is drawn. … many of those who could have provided the most detailed knowledge of important episodes have died without recording their memoirs. Much of what was written in the way of historical accounts was recorded many years after the events took place. Thus most of Nabíl’s Narrative is the record of what Nabíl and his informants at a relatively advanced age could remember of events that had occurred in their youth. Similarly the histories of the Bahá’í Faith in various localities in Persia that we have at present were mostly recorded in the 1930s on the instructions of Shoghi Effendi by elderly believers recalling events that had occurred many years previously. Thus, not surprisingly, both Nabíl’s Narrative and these other histories are often inaccurate with regard to dates (for no one can be expected to remember the exact date of an event that occurred twenty or thirty years previously). … begins on the first day after the new moon is sighted by reliable witnesses. Because the new moon is very close to the sun and is first seen just before sunset, it is difficult to predict exactly on which of two days the new month will begin … there are to this day regular disagreements about the beginning of the month … Because of this, conversions of Muslim dates to Gregorian dates are subject to a one-day error. Owing to these considerations, some events are recorded in the present volume as having taken place circa a particular month or year. Where sources disagree on the date of an event, the date found most widely in Bahá’í literature is the one used in the Chronology, with the alternatives mentioned in the sub-section of the entry entitled Notes. A chronology is necessarily a selection of events: no one book could contain every single thing that occurs. A Basic Bahá’í Chronology attempts to include those events essential to the development of the Bahá’í Faith as we today understand it, as well as many which are less important but nonetheless fascinating. No doubt future historians will point to many omissions, as events often take on significance only in retrospect and may be excluded here because we do not yet appreciate their importance. Life does not occur in neat blocks of time. Events unfold, sometimes over long periods, and have effects long into the future. Similarly, people do many things in their lives. 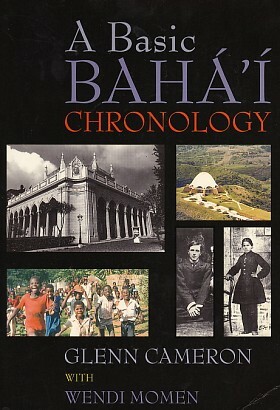 The index to A Basic Bahá’í Chronology enables the reader to follow many events and people over time. Details of each event are kept short but many are followed by a number sources so that the reader may read about the event in a variety of contexts. Where no source has been given, details have generally been supplied by national spiritual assemblies or their chroniclers in correspondence too copious to mention but for which we are extremely grateful. A Basic Bahá’í Chronology highlights the interplay of the forces of darkness and light that so characterize the history of the Bahá’í Faith. The expansion of the religion stands out in bold relief against a backdrop of constant persecution, particularly in the land of its birth. Crises strike almost simultaneously with victories, minor and major, while setbacks in one place are counterbalanced by spurts of growth in another. Another feature of the development of the Bahá’í Faith underscored by the Chronology is the different phases of its expansion. Before the turn of the 20th century almost all the action takes place in the Middle East. Then, suddenly, the scene shifts to North America and to Europe in the early years of the century as the Faith draws new believers from these continents. As the century moves on, however, the scene shifts again, now to South America and more far-flung corners of the planet—Australia, Asia. Then in the 1950s comes the burst of teaching work that takes the Faith to the whole world, and we see the scene shift once again, this time to Africa and the Pacific, rivals in the race to win new converts to the Faith of God. In the 1960s and 1970s Bahá’í youth begin to make a huge impact on the development of the Faith; women’s activities become significant in the 1970s and 1980s; while vast numbers of people begin to enrol in the Faith from the 1960s onwards. In the 1980s Bahá’ís around the world become involved in social and economic development projects and peace initiatives, and the external affairs activities of the Faith begin to blossom even as the Iranian Bahá’í community is effectively silenced. The arts are used more widely to teach the Faith, while increasing efforts are made to reach out to the indigenous peoples of the world, to professionals of all kinds, to people of capacity and leaders of thought. Then in the late 1980s and 1990s come the dramatic changes in Eastern Europe and the former Soviet bloc countries, enabling the last of the territories of the world to be opened to the Bahá’í Faith and their national spiritual assemblies to be formed. A Basic Bahá’í Chronology merely provides the skeleton for this pageant. The reader is encouraged not only to read more thoroughly the history of the Bahá’í Faith but to participate more fully in its unfolding drama. Browse the Chronology at bahai-library.com/chronology.